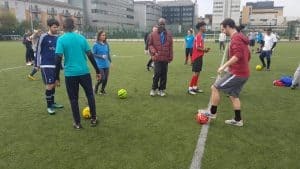 Play2Remember is a football tournament that seeks to use the power of sport & football to promote reconciliation and commemoration. The tournament is jointly organised by Waging Peace and Eric Murangwa’s Football for Hope, Peace and Unity (FHPU Enterprise), the former goalkeeper and captain of the Rwandan national team whose life was saved during the genocide having been recognised as a player for the club supported by a Hutu soldier and subsequently by football teammates who risked their lives to protect his. The event was designed to join Rwandans for the April 7 international day of remembrance for the 1994 genocide against the Tutsi and the United Nations International Day of Sport for Development and Peace (IDSDP) on 6 April. Waging Peace in 2016 then teamed up with FHPU to expand the event to include the commemoration of those who have perished in the Darfur genocide, which began in 2003. Eric and Waging Peace kicked off proceedings by articulating the power to be harnessed from the day, along with the all-important technicalities of the tournament format, which somehow saw Wilsons:FC come away with silverware. This was followed by the linking of hands between every participant in the centre circle. 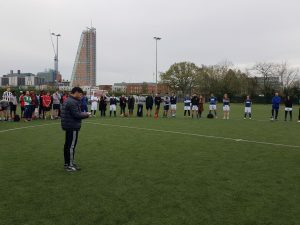 The captains of each of the twelve teams present were then invited to provide an introduction to what had brought them to the event, which heralded a stirring opening speech by an ex-resident of Grenfell tower’s 16th floor, still living in a hotel but looking forward to seeing how the recently assembled side would fare in their debut competition. 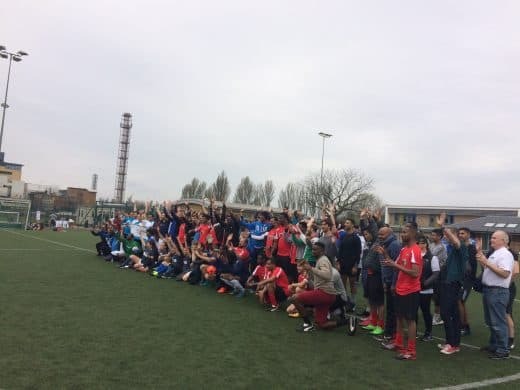 The event was held at Burlington Danes Academy in White City, not far from their former home. Having been encouraged to read from the crib sheets submitted prior to the tournament, team captain for the day Daniel Merriman opted to ad-lib, given the failed late fitness tests of a number of members of staff, which rendered the squad list highly out of date. 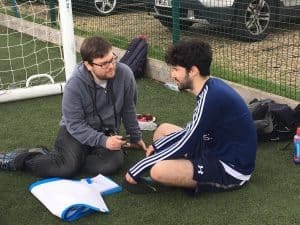 First on the team-sheet as usual were Wilson’s own Kabir Joshi and Georgios Tsigkas, whilst friends of the firm and a young client, who dramatically reduced the average age of the team, completed the side. It goes without saying that Duncan Lewis of course mentioned Wilsons in their missive. Local MP Emma Dent Coad then provided a rousing conclusion/collective team talk and the tournament commenced. 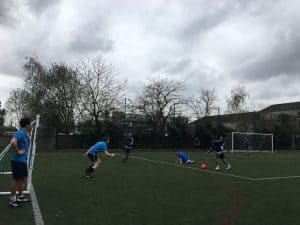 Seemingly groggy from the unusually late Premier League kick off the night before, although probably more likely due to being without a designated goalie, Wilsons:FC slumped to back to back defeats against Diversity United (0-1) and Soccer My Saviour (1-2) in their opening games. Wilsons:FC had all the possession but were picked off in what can only be described as a tactical horror show. Veteran Captain Adam Spray and Team Organiser Muhunthan Paramesvaran were sorely missed, as were Colin Gregory and the recently departed John Sandiford. Not to mention our stalwart star goalie, Tim Davies. Has it been mentioned that Wilsons:FC were lacking someone decent between the sticks? regrouped with a 4-0 victory over Team Grenfell, with Kabir getting on the score sheet. This put Wilsons:FC into the third tier knock out stage and thus opened up the possibility of a third successive penalty shoot-out exit. This makeshift Wilsons:FC side could not contemplate such a proposition. The UNA-UK were duly routed 3-0 in the semis as one of their representatives asked, ‘how did you lot end up against us? The comprehensive win set up a tantalising a final match-up with our friends from BID. In full knowledge of the team’s previous bitter exits at the competition having played for us, Tom at BID was overheard in his opposition managerial debrief to call for parking the bus against an overly attacking Wilsons:FC side as to hold out for penalties. Lo and behold, long balls abounded but Wilsons:FC stuck to their principles and their free-flowing football. This was aided by a convenient rule change allowing entry into the penalty area, which suited Wilsons:FC’s more eye-pleasing style and eventually bore fruit for the favourites. Daniel took advantage and nipped in with the only goal of the game. 1-0 meant the smallest trophy of the day was heading back to N17. The heavens started to open up as the uplifting denouement to the day manifested itself in additional discussion about hope and strength in togetherness as demonstrated by those present; survivors of genocide and mass atrocities from Rwanda to Sudan, Srebrenica to W11 and their friends, families, supporters, campaigners, and advocates. Thence the all-important presentation of the certificates and cups took place. Congratulations to the actual winners of the tournament, Team Sudan. We thank Waging Peace and FHPU for yet another inspiring and special day. Further information can be found in the coverage of the tournament by the Evening Standard, London Live and ITV.